I first came across the work of Dr Russ Harris when I started listening to his 'Mindfulness of the Breath' CD. I've had great success with his CD so I was looking forward to reading one of his many books, The Reality Slap. 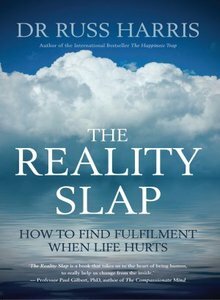 A 'Reality Slap' can be something that happens in life like an illness, fire, bankruptcy, divorce or loss of a loved one. Dr Russ Harris is an Australian and I responded immediately to his down to earth writing style, and he gave me much food for thought. I guess you could call The Reality Slap a self-help book, however it's definitely a book with a difference! Dr Harris acknowledges the 'internal chatter' that readers experience, and that some readers will struggle with the content. Somehow he manages to gently leads us through, even sharing lessons he has learned in his own life struggles, endearing himself to the reader even further. I also enjoyed the list of 60 Life Values in Appendix 5, which was an interesting exercise to work through. "Thank you for this lovely feedback, Tracey. You have made my day. Good luck with your ongoing journey. I don't usually read these types but I may look into it.